Peabody Energy is paying a handsome price to fix a debt problem it has, but it's not nearly as bad as the debt issues facing Walter Energy. Peabody Energy (NYSE:BTU) is in a tight spot. The coal market is struggling and the miner was at risk of falling out of compliance with key debt covenants that could have made life a bit more difficult down the line. But it was willing to pay up to fix the issue. While that may sound bad, it's actually a good thing. In 2006, Peabody Energy sold convertible bonds. The amount outstanding is roughly $730 million. That's a notable slice of the nearly $6 billion in debt the company had at the end of the first quarter. However, the really interesting thing is that the convertible bond had a wrinkle attached to it. If Peabody Energy's debt to earnings before interest, taxes, depreciation, and amortization (EBITDA) was more than 6 times and the ratio of EBITDA to interest expense was less than 2 times for three consecutive quarters, the original covenants would have required the miner to issue warrants and preferred shares to cover the interest payment. This debt was issued in conjunction with Peabody Energy's purchase of Australia's Excel Energy. Source: Centpacrr, via Wikimedia Commons. The idea was to limit the impact the debt would have on the company's balance sheet. However, selling warrants and preferred shares is undesirable right now. So Peabody Energy asked bond holders for a waiver of that covenant, paying an $11 million payment to get their approval. Its initial offer was about $2 million. How's it going to pay instead? Having received the approvals, Peabody is no longer at risk of falling out of compliance or having to issue warrants or preferred shares. The funny thing is that Peabody Energy wasn't looking to get out from under the cash payments it's obliged to make. It just wanted to keep paying them out of revenues instead of issuing securities. In essence, the company is saying, "We're strong enough to keep paying, even though the coal market is under pressure right now." That's a far cry from Walter Energy (NASDAQOTH:WLTGQ) and its most recent debt efforts. For starters, Peabody Energy's debt makes up roughly 60% of its capital structure. At Walter Energy that figure is about 80%. That's a big difference. It helps explain why Walter Energy has been refinancing its debt to extend maturities. That will buy it time for the metallurgical coal market, its focus, to recover. However, that's not all the met coal miner has been doing. Walter Energy also added a payment in kind provision to a new $350 million issue. The payment in kind provision, often called a PIK provision, allows Walter Energy to issue bond holders more debt instead of paying them in cash. That's almost the exact opposite of what Peabody Energy just got done. And a company usually doesn't include a PIK option unless it's concerned it won't be able to come up with enough cash to make an interest payment. That isn't to say Walter Energy will ever make use of the PIK provision, but it is clearly keeping its options open. While a shareholder may look at that as a statement of weakness, to be fair, maintaining financial flexibility during a deep industry downturn is the right thing to do. 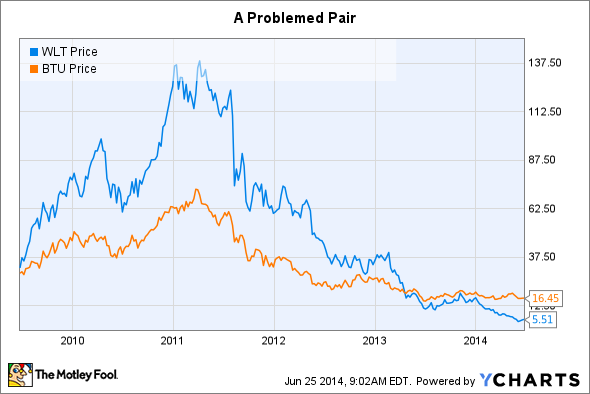 So, clearly Peabody Energy and Walter Energy are in two vastly different positions right now. Peabody Energy, despite the difficult coal market, is telling the world it has the financial strength to make good on its obligations. And it's willing to pay up for the right to do so. Walter Energy is saying that debt could become a problem at some point. And while doing something about that potential is good business, it's understandably disconcerting for shareholders. Conservative investors should continue to avoid Walter Energy until the metallurgical coal market starts to recover. Peabody Energy, meanwhile, is clearly in a better position financially despite the debt “issue” it has just resolved. That could make it of interest if you believe in buying when there's blood in the streets.